Corporate gift, it is a phrase and implement used by many to motivate employees and expose a brand. They come in a plethora of forms, but rarely do we see one so premium and pristine as the 3D engraved glass cube. A Corporate gift needs to be memorable, your brand needs to be represented in a memento that is both premium and stands the test of time. 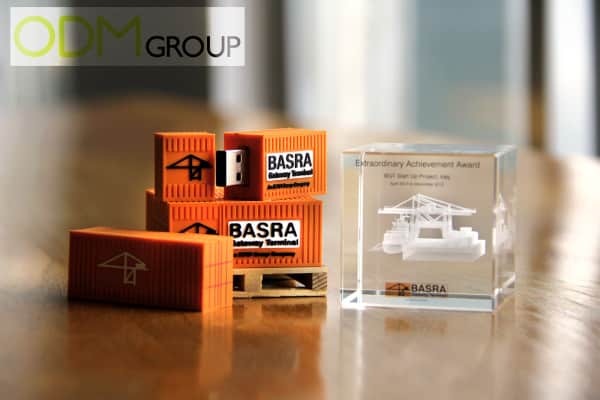 Basra Gateway Terminal had some great ideas for a corporate gift, and we helped to produce them. In this blog we will take you through the 3D engraved glass cube, its production process, and how you can customize one to match your business. If you are interested in why this promotional product is a great one, and how you can use it, read our blog on the Customised 3D Glass Cube and why its a great idea for brand activation. Freight industry promos are one of our specialties. We know how important it is for your promotional idea to look and feel great to give that lasting impression. See how this shipping container USB compliments the promotional glass cube, with an exceptional 3D Shipping dock. A corporate gift should have consistent branding, given as a set as here it can be a great way to motivate employees. 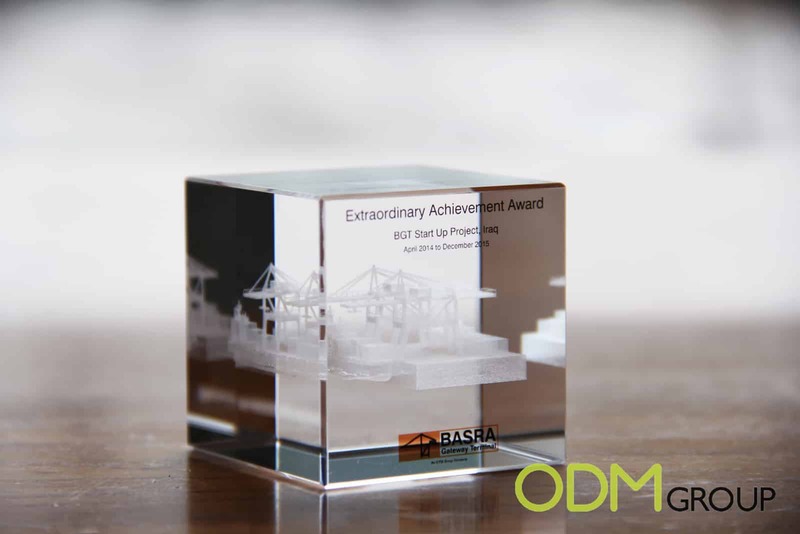 But how do ODM and Mindsparkz produce this corporate gift? 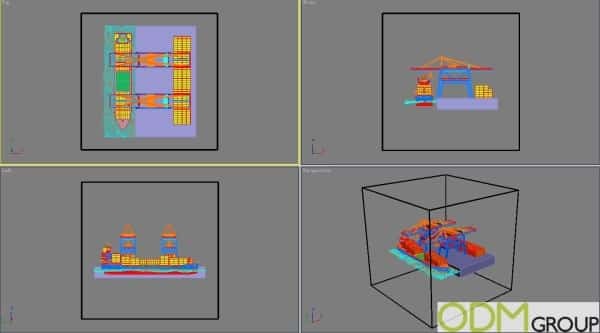 After using an image provided to us of a shipping dock, our in house design team , Mindsparkz gets to the challenging task of translating this into something produceable. Our designers intricately draw each angle of the port, line by line the shipping port is constructed ready to be brought to life in 3D. 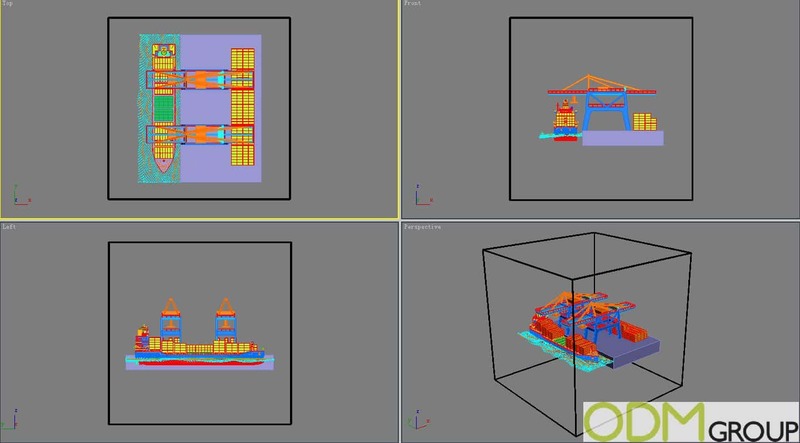 After we have each angle covered to create a 3d model, Mindsparkz can continue bringing the promotional idea to life. Designed in 3D, the port looks astonishing. Highlighted in multiple colours for clarity in production, to ensure no miscommunication with our supplier. After our client has communicated to us what their promotional idea is, we convert it into a produce-able 3d glass cube. The next hurdle is communicating to the factory. We have done the legwork for you however, using our preferred suppliers communication is clear and concise using our technical design. Our supplier then gets to work shaping and bezzeling the artificial crystal. Once shaped, the provided logo and text is printed on PVC, which is then UV blasted to print on the front of the cube. Next up is laser engraving. The engraving process requires rather complex laser machinery. Line by line the laser engraves the image, based on our design, within the glass cube. After the engraving is completed, the cubes are polished and we ensure Quality control for each item. This corporate gift can be customized to suit any business. 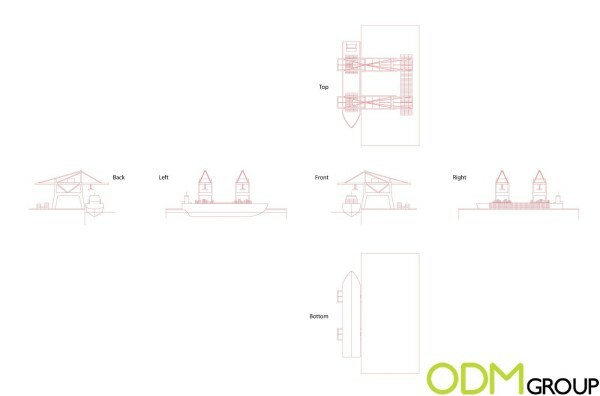 Where here we see a shipping dock, a car, logo, or football court could be in its place. Sport merchandise could be one notable way this promotional product could be used. When it comes to creating a great corporate gift, precision is required in production. Quality control is needed to give the product that memorable edge. We have over 10 years of experience in promotional products. Let us know your next corporate gift project, or if interested in other forms of promotional products, we have comprehensive pages on gift with purchase, POS Display and many more.